This 6 3/8 " alphabet plate has a crisp image transfer printed in rich dark chocolate brown with great color polychrome hand painting in bright green and cinnamon brown. 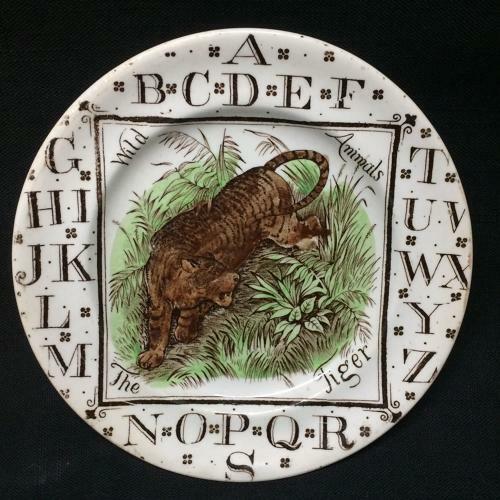 In addition to the entire ABC alphabet transfer with the classic Brownhills decorative clover transfer, this plate has a central cartouche of a Tiger stalking in the dense vegetation. Condition is great. Clean and bright. No chips, no cracks, no hairlines and no repairs.